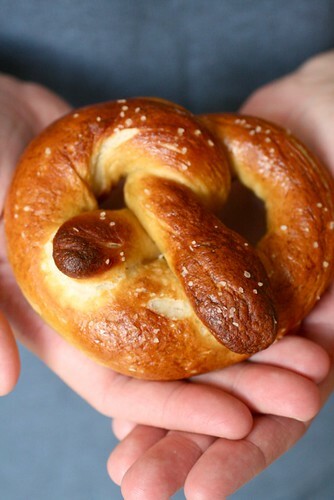 This is not the first time these soft pretzels have appeared on the blog. Almost exactly one year ago, I hosted a summer fun and games night for my friends, and I served these pretzels. They were a huge hit! At that time, I mentioned that it might be a good idea to experimenting with freezing the pretzels at some point in the process to avoid having to make them fresh just before a party, therefore making them more party-friendly. 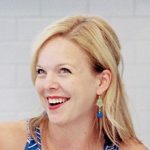 In case you haven’t noticed, I tend to keep myself fairly busy in the kitchen, and I never got around to the pretzel experiments, but I also never forgot. Finally I decided to just buckle down and make it happen. So, recently I tried three different methods of making the pretzels. 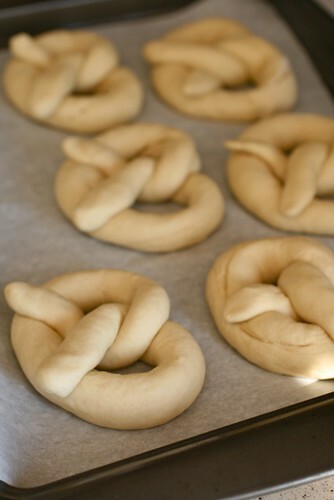 First, I made them the usual way – shaping the dough, boiling, baking and serving all at once (pretzel A). I also tried freezing some that had been freshly boiled and baked (pretzel B). I thawed these in the microwave on defrost and then rewarmed in the oven. Finally, I tried freezing some of the shaped pretzels after shaping (pretzel C). I boiled these directly from the freezer, adding about 15 seconds to the boiling time, and baking for a minute or two longer than normal. The verdict? All three methods work wonderfully. Ben and I agreed that of the two pretzels that had been frozen, those that were boiled directly from the freezer and then baked (pretzel C) were just ever so slightly better in texture than those that had been frozen after baking. That said, all of the options were fantastic and I would not hesitate to serve any of them at the party. That is fantastic news, so you can choose whatever option is most convenient for your schedule. I have left the recipe below as is, but just know that you have several prep choices available. To make the dough, combine the water, sugar, salt and yeast in the bowl of a stand mixer fitted with the paddle attachment. Mix on low speed to dissolve the yeast. Add in the flour and melted butter and mix just until the dough comes together. Switch to the dough hook and knead on medium speed until the dough is smooth and clears the sides of the bowl, about 5 minutes. 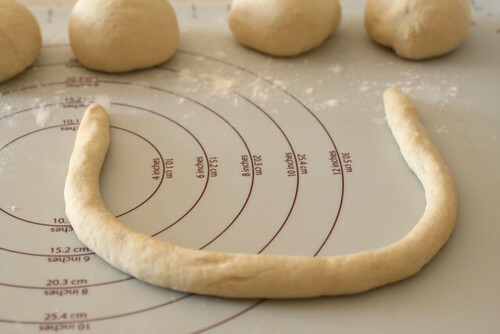 Transfer the dough to a bowl lightly greased with vegetable oil, turning once to coat. Cover with plastic wrap and let rise in a warm place, about 50-55 minutes or until doubled in bulk. 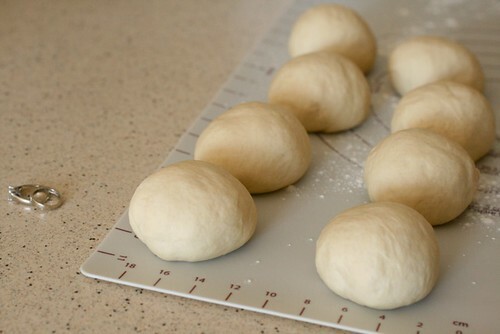 In the meantime, divide the dough into 8 equal pieces. 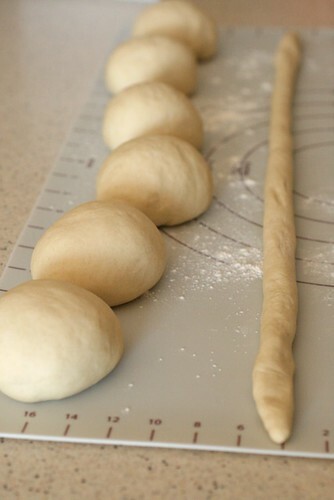 Working with one piece at a time, roll a segment out into a 24-inch long rope. 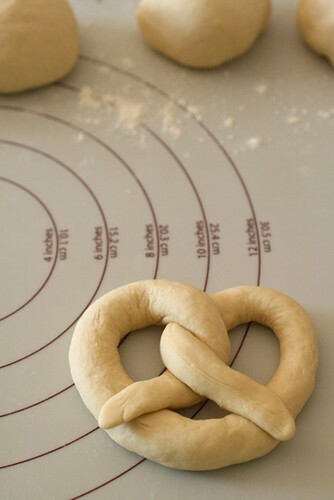 cross them over each other and onto the bottom of the U-shape in order to form the shape of a pretzel. Repeat with the remaining pieces of dough. Place the pretzels into the boiling water, 1 or 2 at a time, for 30 seconds. Remove from the water with a slotted skimmer and place on the baking sheet. Once all the pretzels have been boiled, brush the tops with the egg wash and sprinkle lightly with salt. Bake in the preheated oven until dark golden brown, about 12-14 minutes. Transfer to a cooling rack for at least 5 minutes before serving.